Sometimes surprising your little one(s) with a new toy can make a long car trip much more enjoyable. 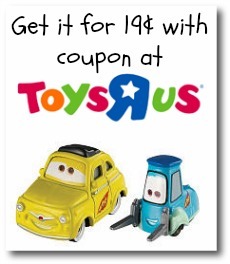 Right now you can grab Disney Pixar Cars, 2 pk., for 19¢ at Toys R Us! The coupon may go quickly, so print it out soon if you plan on grabbing this deal.